That pitch, bounced low and in to Jake Lamb, was Kenta Maeda’s first cutter thrown in MLB. 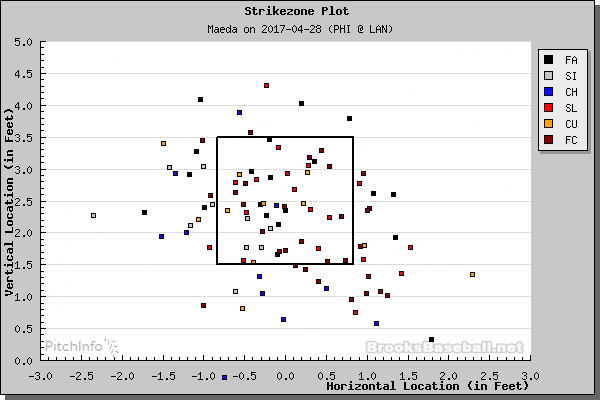 It shows up better here, a plot of the horizontal movement and velocity of Maeda’s pitches from that day, courtesy of Brooks Baseball. The first one wasn’t executed, but it was proof that he could do it. Of the 3137 tracked pitches Maeda threw in the regular season, that was his very first cutter. 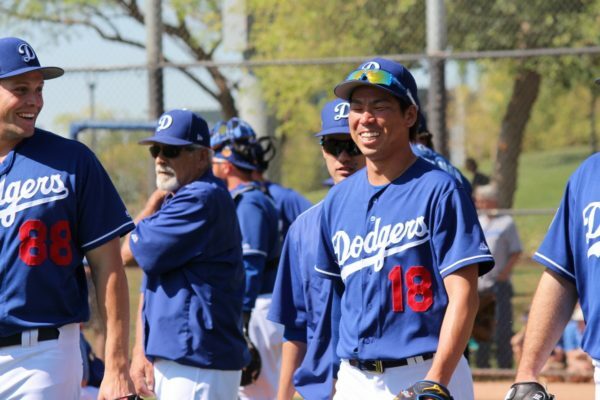 Maeda accepted management’s suggestion to gain weight for more durability, and he’s up to 190 pounds, after checking in a year ago at 175. It is hoped the cutter gives Maeda a pitch that won’t tail back over the plate against left-handed batters, who posted a .730 OPS against Maeda, compared to .580 for right-handed hitters. Maeda said the weight gain has become a bigger story than it deserves, because it occurred over a year’s time. The cutter, he hopes, will induce ground balls and allow him to save his changeup for swing-and-miss situations. See that big gap that filled in between the slider and the fastball? Those are cutters. You can now get a sense of how the pitch bleeds into the pitches around it. That isn’t necessarily a bad thing, because it can add some more deception. Clayton Kershaw has a slider that bleeds into a cutter, too, so at least Maeda has some good company there. 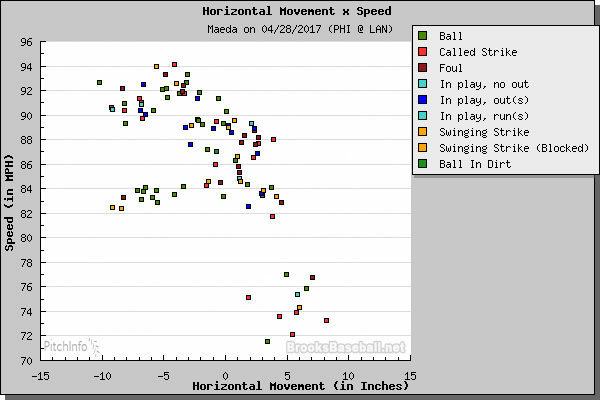 Here you can see what Maeda was talking about with left-handed hitters. His slider does not necessarily run enough that he can aim at their back feet or back-door it well, so instead he has to rely upon his not-as-good change to get swings and misses. Maeda’s cutter doesn’t run a lot either, but it the fact that it gives batters something else to think about can help the results. There’s still a few leaking over the plate, but overall it’s not nearly as bad as some of his other pitches and definitely not as bad as he was earlier this year. That plot is an indication that Maeda has not been fixed quite yet. 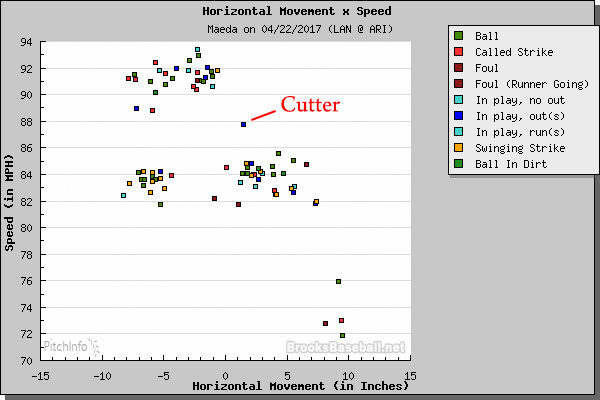 Overall, Maeda’s cutter averaged +6.3 inches of vertical movement and +0.3 of horizontal movement in last night’s start. That’s a good amount of sink from his fastball (which averages close to +10 of vertical movement). It’s hard to draw super meaningful conclusions from one start, particularly given how weird movement data is right now, but it shows that the pitch is not so much about the run as it is the sink. That matches what we’re seeing above. Maeda’s cutter seems not dissimilar to Clay Buchholz or Jeremy Hellickson‘s from last year, which are not flattering comparables but are pitchers who have been solid major league regulars when healthy. Incidentally, third-highest on the “cutter sink” leaderboard among starters last year was Bud Norris, which is a good reminder that commanding the pitch still matters a lot. Maeda may well have saved his job last night, and his brand new cutter is at least part of the reason why. Now that it’s in the scouting report, it will be interesting to see the push and pull of adjustments, provided that Maeda can stick in the rotation. After an immensely positive result yesterday, it’s so much nicer to have thoughts like this.